The year is 1912. Adèle Blanc-Sec (Louise Bourgoin in her debut feature), an intrepid young reporter, will go to any lengths to achieve her aims, including sailing to Egypt to tackle mummies of all shapes and sizes. OK, not the snappiest title in recent years, but anything from director Luc Besson (Nikita, Léon, The Big Blue...oh, you know who he is), is usually worth a look, however daffy the plot may sound. And The Extraordinary Adventures of Adèle Blanc-Sec (Les aventures extraordinaires d'Adèle Blanc-Sec) certainly sounds daffy, but hopefully in a manner that will bring pleasure rather than pain. Based on the comic book by Jacques Tardi and starring Louise Bourgoin, Mathieu Amalric (The Diving Bell and the Butterfly) and Gilles Lellouche (Little White Lies), it was described by Empire as "A romp magnifique, with enough thrills, giggles and pretty pictures to reward adventure-lovers who wouldn't normally entertain the idea of taking in a treat with subtitles." 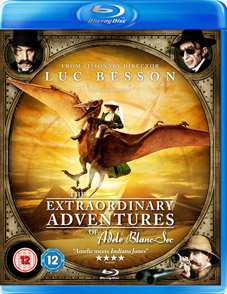 The Extraordinary Adventures of Adèle Blanc-Sec will be released on UK DVD and Blu-ray by Optimum Home Entertainment on 15th August 2011 at the RRP of £17.99 for the DVD and £22.99 for the other one. Limited Collectors Edition Double Play Steelbook includes four artcards.